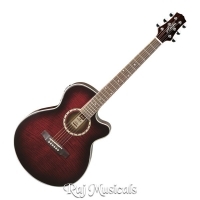 Ashton SL29CEQ WRS semi acoustic guitar, easy to handle with a slimmer body, mahogany neck and rosewood fingerboard, this is one guitar that has looks far beyond its price range. Easy to handle with a slimmer body, Mahogany neck and Rosewood fingerboard, this is one guitar that has looks far beyond its price range. Great for a jam at home, or plug into your amp using your 4 band EQ and hit the stage.